Birch Cleave Wood (SX 826 826), Birch Down (SX 816 873), Birch Ellers Mine (SX 826 871), Birch Tree Farm (SX 8225 8733), Birch Pool (SX 7332 6811) Birch Tor (SX 687 814), Birchanger Cross (SX 7728 7557), Birch Wood ( SX 705 673), and Birchey Lake (SX 6199 9310). No prizes for guessing what all these Dartmoor places have in common. Today it’s obvious the first place-name element indicates a birch tree or trees and they all stem from the Anglo Saxon word ‘beorc‘, Clark Hall, p.42. In most of these cases the second element is obvious; Down, Lake, Wood etc. apart from Birchanger Cross. Ekwall suggests that the word ‘Birchanger’ derives from two elements; beorc meaning ‘birch’ and hangra meaning ‘wooded slope’ thus giving the’ wooded birch slope’. p.44. So from just these few place-names it is fair to suggest that there is evidence of a connection between the birch tree and Dartmoor. In the Ogham script the birch tree was represented by the word Beith and was the first letter of it’s alphabet, and beorc was the runic letter ‘B’. To be exact here we are talking about the the Downy Birch also known as the European White Birch or Moor Birch aka the rather suggestive Latin name of Betula pubescens. It is a native tree species to Dartmoor and as Worth writes; “The birch does appear to have been somewhat wider spread in past days, and the remains of dwarf birches are at time found in the peat bogs at some little distance below the surface.” p.66. It has been suggested that birch trees began to make their presence known in pioneer woodlands on Dartmoor between 9,600 and 9,000 BP during the Holocene period where they (along with oak and hazel) dominated the woodlands for the next 8,000 years. Mercer, p.87. The downy birch trees are found on damper soils than it’s close relative the silver birch and is quite capable of tolerating waterlogged or peaty conditions. The trees are capable of reaching heights which range from 10 to 20 metres tall with girths of between 0.3 and 0.6 metres, The leaves of the downy birch are triangular in shape with a soft downy stalk which is where its name ‘downy’ derives from. Between April and May the downy birch produces two types of catkins which are both male and female. The males catkins are longish and a yellowy brown in colour which hang down in clusters of two or four, often called ‘lamb’s tails’. Whereas the female catkins are a fair bit smaller and shorter and of a bright green colour. The female catkins are wind pollinated following which they thicken and change to a darkish crimson colour. During the autumn masses of small, winged seeds are produced which are then dispersed by the wind. Birch woods, which can comprise of both downy and silver birch tend to have a light, open canopies which provide the ideal environment for a host of grasses, lichen and mosses to thrive along with a whole range of flora such as bluebells, violets, wood anemones etc. Downy birch trees are a veritable larder for what has been suggested to be around three hundred insect species. The leaves are particularly attractive to aphids which provides a vital food source for larger insects such as ladybirds whilst the leaves themselves cater for a variety of caterpillars. These woods are also a popular haunt of a magnitude of diverse fungi especially fly agaric, birch milk cap, chanterelle and razor strop. As far as bird life goes the seeds of the downy birch are a favourite of such species as the siskin, greenfinches and redpolls. It is not unusual to find that woodpeckers and other hole-nesting birds have made their homes in the trunks of the downy birch. Downy birch heartwood tends to be of a light reddish brown colour with a virtually white sapwood. The wood takes on the appearance of being dull and uniform in colour, this is due to the fact the annual growth rings are virtually undetectable. The wood is tough and heavy which makes it ideal for furniture making and turned objects such as handles, toys, bobbins, reels and spools. In more recent times it is probably one of the more widely used woods used in the manufacture of veneers, plywood, panels and doors. Another interesting feature of the downy birch are the large clusters of what appear to be small, brown twigs which appear on the bare trees and are capable of lasting for many years and in some cases for the life of the host plant. These growths are commonly known as ‘Witch’s Broom’ due to their similarity in appearance to that of a witch’s favoured mode of transport. These ‘nests’ are caused by a fungus – Taphrina betulina, which has the ability to stimulate the tree to produce numerous extra shoots thus resulting in a dense nest-like clusters. The fungus can then feed on the shoots. 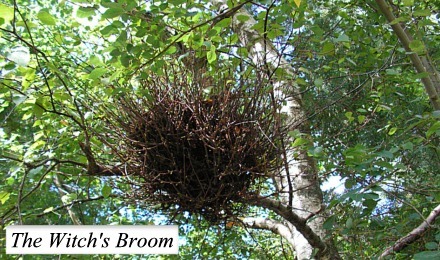 It was first thought that the ‘witch’s broom’ appeared as a result of an actual witch flying over the tree and as it’s possible for a single tree to have numerous ‘nests’ would indicate a popular flight path of the crones. It was/is believed that birch wood had the power to drive out evil and for this reason it is thought that the punishment of ‘birching’ was dished out to naughty children and criminal offenders. Although not always made from birch the ‘birch rod’ was a sheaf-like bundle of leafless twigs which were bound together and then vigorously applied to the offenders shoulders, back or buttocks. One place on Dartmoor where ‘birching’ was a popular form of punishment was the prison at Princetown, another being at the various petty assize courts. There are numerous newspaper reports of such a punishments being dished out, just two being; “Two prisoners, Harry Franks and George Barker for assaulting assistant warders, were each sentenced to receive a dozen strokes of the birch, accompanied by the remission of marks and to wear the black dress and chains for six months.” – The Devon & Exeter Express, August 17th, 1908. Likewise at Newton Abbot assizes in a 12 year old boy from Buckfastleigh was charged with stealing a pair of roller skates which were worth two shillings. He was found guilty and sentenced to receive twelve strokes with the birch rod. The Western Times, January 10th, 1879. Birch sticks are often part of the ritual of ‘Beating the Bounds‘ at which the various boundary points are severely thrashed and in some cases so are the attending youngsters,, the purpose of which is to ensure that they remember the extent of the parish or manor bounds. It was also believed that cradles that were made from birch would protect the new-born babies from being stolen by the piskies are other such malevolent creatures. Another belief was that if a pregnant cow was lead with a birch goad then its calf or calves were bound to be ‘go doers’. Additionally it is believed that birch trees never get struck by lightnening. The strong and water-resistant cardboard-like bark of the downy birch has been used for many things such as a substitute for writing paper and manuscripts. There are early birch bark manuscripts dating back to the first century on which Buddhist texts were written. In both of the World Wars when postcards were in short supply soldiers would write letters home on birch bark stripped from the trees. The oil from the inner bark is an astringent and can be used to treat wounds. The outer bark has antibacterial properties and when used as a container for food and water, it is believed to inhibit the growth of bacteria. 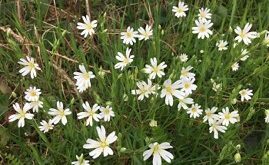 In his famous book ‘The British Herbal’ the herbalist Thomas Culpeper wrote; “It is a tree of Venus. The juice of the leaves, while they are young, or the distilled water of them, or the water that comes from the tree being bored with an auger, and distilled afterwards ; any of these being drank for some days together, is available to break the stone in the kidneys and bladder, and is good also to wash sore mouths.” – p.46. Birch sap is another constituent of the tree which has seen many uses both practical and of an alcoholic nature. Firstly the sap is highly rich in sugar and when tapped in late winter/early summer spring along with the addition of some honey can be made into birch wine. It can also be drunk in its natural state as birch water (which is high in vitamin C) as well as being made into mead and beer. For culinary purposes the sap can be made into syrup or vinegar. For how to harvest birch sap there is a short video of Ray Mears showing the method and other uses of the birch tree, it can be found – HERE. Clark Hall, J. R. 2004. The Concise Anglo-Saxon Dictionary. Canada:Cambridge University Press. Culpeper, T. 1870. Culpeper’s British Herbal, London: Nicholson & Sons Ltd.
Ekwall, E. 1980. The Concise Oxford Dictionary of English Place-names. Oxford: Oxford University Press. Mercer, I, 2009. Dartmoor – A Statement in Time. London: Harper Collins Publishing. Worth, R. H. 1988. Worth’s Dartmoor. Newton Abbot: David & Charles.